Previously on fabbrication, we had initiated a self-analysis. Correlating the evolution of the architect with shifting methods of production through time, we glimpsed into the time until the Industrial Revolution to gather as many threads as possible which will eventually interweave with the topics we will be covering. Through the end, we left Alberti drawing definitive lines for the role of the architect. His approach in design fabrication is still a major part of another issue, but rather let us focus on how his conception of the architect fares in pre-Industrial Revolution. In his diaries chronicling the arts, culture and politics of 17th century, John Evelyn listed four types of architects in his “Account of Architects” dating 1664; architectus ingenio, architectus sumptuarium, architectus manuarius, architectus verborum. The first group represented the ideal architect for Evelyn (the ultimate architect figure resembling his close friend Christopher Wren) – the man of ideas and drawing or the more common type of architect-surveyor who is skillful in the “Art of Building” that “superintends and presides” over the “commonly illiterate Mechanick”.1 The second group represented the man of money – the client, the patron. Architectus Manuarius was the craftsman – whether a mason, joiner or carpenter who actually carries out the building. Finally there was architectus verborum – the architectural writer, similar to the current persona we had donned for the sake of the introspection we had started last month. Christopher Wren as the architectus ingenio, Robert Owen as the architectus sumptuarium, unidentified craftsman as the architectus manuarius, and John Evelyn as the architectus verborum. Collage by Efe Gözen, 2017. Shared Latin nouns for naming different parties of the building realization is definitely confusing. No wonder some people still confuse architects as contractors. The multitude of definitions for building realization hints how people with different backgrounds and training all strive to be synonymous as the creator. At last we have a partial answer to one of the questions we have been pondering about. Architectus manuarius significantly outnumbered the others due to more demand for simple housing until the Industrial Revolution. Coming from a guild-like training, they had great expertise on site – especially in the realization of housing demands. However, rapid migration to cities meant demand for vast amounts of housing on a scale they were not familiar in a level of complexity they had never seen – rendering them inefficient and insufficient. Architectus ingenio was tapped in to undertake mass housing projects. Even though they had limited experience regarding the function (setting the few villa projects aside), increased complexity levels of the projects favored them over architectus manuarius as they were more experienced with projects requiring higher degree of coordination. There were very few of them, and they were also occupied with other jobs such as surveying the land for future settlements, leveling, etc. Gradually, the social status of the architect was upgraded, codes of practice were established and professional ethics began to be sketched out. Further refinement of the roles were necessary under the guidance of the new paradigm to accommodate the newfound ambitions of architectus ingenio, and train more of them. As a means of professional self-defense during a period of adjustment and change in the building industry, they felt the urge to set themselves apart from the builders. First professional institute for the “architect”, Royal Institute of British Architects (RIBA) was established in 1834. Main aim of RIBA was to draw a distinction between the architect and the other specialized ranks of the building industry, protecting and prioritizing the architect from misunderstanding of the profession classifications. RIBA also institutionalized and modernized the architectural education, rendering it fit for mass education and redefining the pupilage model which had emerged with the decline of the guilds in the process. Pupilage system was comparable to the times in Ancient Egypt and Greece where information was passed on from one generation to another, yet unlike their predecessors most of (if not all) practitioners had very limited experience about material behavior and building methods. Polytechnic schools served as the foundation for the new architectural study, a proven system in training of the engineers. New schools trained refined derivatives of architectus ingenio, an architect honed for his coordination and planning skills with deteriorated applied knowledge compared to his prior counterparts. The idea of art in building as the special province of the architect replaced the physical connection to building site and the material, further emphasizing the architects’ distinction from builders. Introduction of art into architecture was also a part of constituting an individual identity within the increasing amount of architects. Come forth Arts and Crafts – a movement that garnered a huge support from the English architects who were dismayed with the technologic advancements and had strong negative feelings about industrialization and machinery. Anyone else finding this relative to present-day? 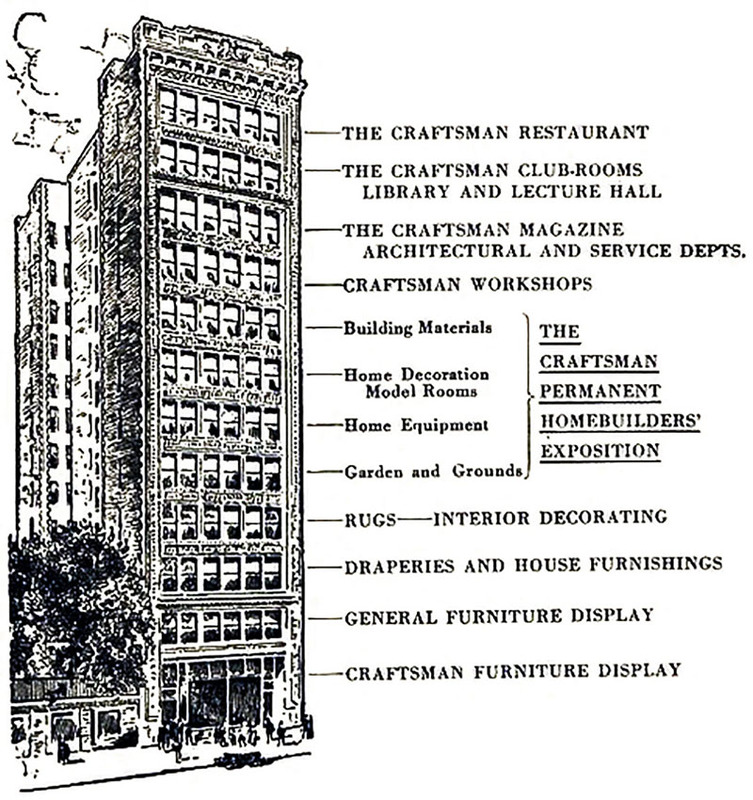 The diagram of Craftsman Building in New York City. Irony in a nutshell, Gustav Stickley advocated the superiority of Arts and Crafts and manual labor over machinery in an early high rise which could only be built due to technological advancements – the invention of elevator. He filed for bankruptcy in 1915. Arts and Crafts with Art Nouveau, its later counterpart across the Channel which was globally significant through the internationally renowned Beaux-Arts educational system, blurred the line in between architecture and arts. This line was so blurred and the context was long forgotten over the course of more than a century that some architects are still deceived and tend to reduce architecture to merely a form of art whereas some perceive it simply as the preparation of line works (read: drawings). Is it not time to drop the false attributions? Reiterating his avid support for the architect to design for any building material and to use any technical device; Alberti certainly was not indicating the isolation of the architect in his high castle (read: office) ripped of any material connection to the site where the building is realized, nor did he imply the architect should act the three monkeys on the progress of technology and its imaginable novel applications. An important figure on the coast of the Mediterranean, Antoni Gaudi and the way he practiced architecture seems in alignment with the ideals of Albert, which we will be covering in detail on the upcoming issues. Back to the chronicle. Effects of Industrialism were sweeping the continent as Germany and Italy were the last countries to catch up with the wind due to their late unifications into nation states. In Deutscher Werkbund conference of 1914, Hermann Muthesius proposed that the main task of the architect should be to evolve standard building types for the new nation for Germany to develop itself rapidly.2 Industrialization matured and was embodied in Modernism. Starting from early 20th century and peaking in the middle of the century, it was the time where the notions of mass production, mass consumption, mass education, standardization and centralization – fundamental to the characterization of Alvin Toffler’s Second Wave, dominated every aspect of life. 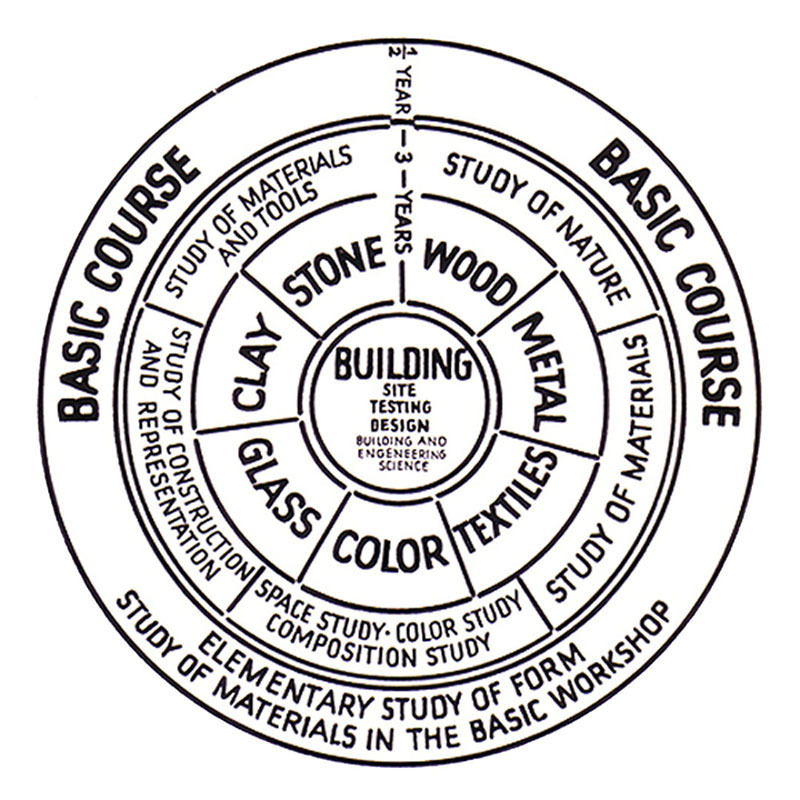 Bauhaus Wheel diagram depicting the courses and its relation with building. Walter Gropius founded Bauhaus in Weimar in 1919, merging the Grand Ducal School of Arts and Crafts and the Weimar Academy of Fine Art. Gropius strived to reinterpret the medieval workshop in which craftsmen would work on common projects together with the ultimate the complete building at its core, although architecture was not part of the school’s curriculum in the founding years.3 Even the name of the school intentionally hinted Bauhütte, a premodern guild of builders. Adapting to the world of machines and volatile politics, Bauhaus moved to Dessau where Gropius’s successor Hannes Meyer would run the newly founded architecture program. Eventually succumbing under Meyer’s radical functionalism, Ludwig Mies van der Rohe’s larger than life personality, and the hostile political environment, Bauhaus would be shutdown. Although leaving a huge impact on architects and the profession, Gropius’s quest to raise craftsmen without class distinctions would be over. The Modernist’s ever raising self-image would inspire cult fictional lone figures such as Ayn Rand’s Howard Roark. Whether they shared the same work ethics with Roark or not, a majority of Modernists definitely shared his self-perceived impeccability and the egoistic moral ideas. Ironically, Roarkish architect’s ego would run in plain contradiction with the forces acting on the profession he would experience. As the complexity of the act of building vastly increased and the professions now being extremely specialized, participation from engineers during the process was expected as well as legal experts to whom ― creativity could be barely ascribed to. Cooperating with all of them, and taking feedback from non-creatives? This created an existential crisis for the architect. Despite its revolutionary start for the profession, Modernism fast lapsed into a mere matter of style or superficial philosophy. The paradigm shift in production methods in mid-20th century would usher the arrival of a new wave as we started to move away from manufacturing of goods to the production of the data for the creation of physical entity. John T. Parsons’s a Motor Controlled Apparatus for Positioning Machine Tool, which he developed in MIT and filed for a patent in 1952 built upon its punch-card ancestor Jacquard Loom4, becoming the first Numerical Control (NC) through bits and bytes. 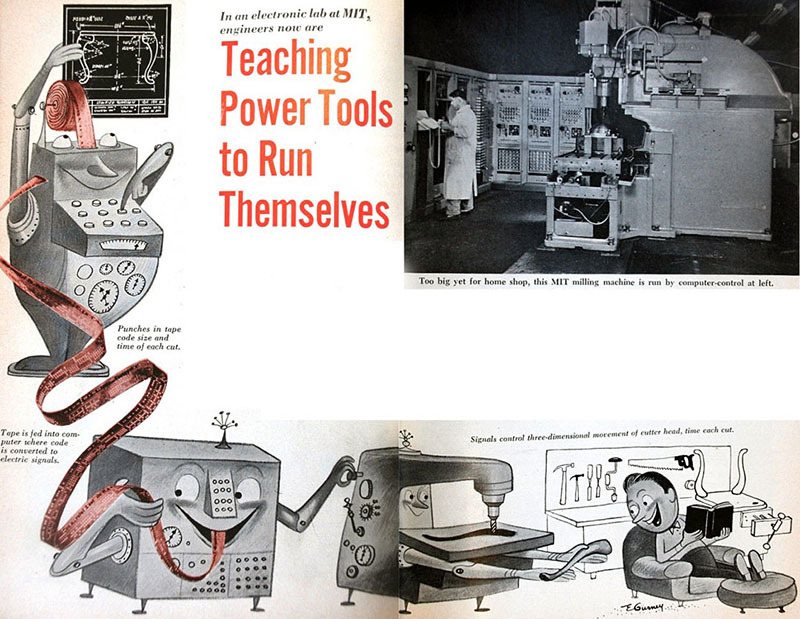 Friendly introduction of CNC to the public, article by Hartlay E. Howe for Popular Science in August 1955. We were introduced to the Orange’s5 ancestor, we got some answers to our questions, yet the main question remains unanswered – what does the present and the future hold for the architect? We will find out as we conclude the trilogy on the evolution of the architect in the next issue. Crinson, M. (1994). Architecture-art or profession? Three hundred years of architectural education in Britain. Manchester: Manchester University Press. Saint, A. (1985). Image of the Architect. Yale University Press. Whitford, Frank, ed. (1992). The Bauhaus: Masters & Students by Themselves. London: Conran Octopus. Although Basile Bouchon’s loom that utilizes perforated paper predates the Jacquard Loom by 80 years (1725), it was a semi-automated machine requiring an operator. Since our robotic arm stil does not have a name, we call it with its color. This article has been published as part of the column FABBRICATION in XXI, vol.157, March 2017. This article can be accessed here in Turkish.